Kat’s Ribbon of Hope thanks you for making our 5th annual benefit a big success! Thank you for supporting the Kat’s Ribbon of Hope Fifth Annual Golf Outing and Benefit Dinner on October 12th at Nassau Country Club in Glen Cove, NY. What started out to be a rainy, windy morning cleared up to be a gorgeous day for the 100 golfers who played in honor of breast cancer awareness. Nearly 375 supporters attended the Benefit Dinner which started with the cocktail hour and silent auction and was followed by dinner and live action under a magnificent tent. Dr. Eleni Andreopoulou of Weill Cornell Medicine Breast Center gave the keynote address and the crowd was entertained by famous speed painter, Tim Decker who created three amazing works of art that were auctioned off. With your help and generosity we are proud to announce that KROH raised over $350,000. We thank you for your continued support. 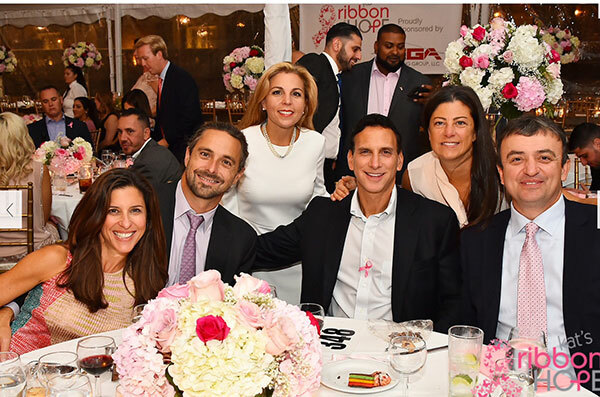 Kat’s Ribbon of Hope remains focusing on contributing to clinical trials and research at three of the most prestigious cancer treatment hospitals in the United States (MSKCC, Weill Cornell Medicine & the Feinstein Institute for Medical Research). It makes us so proud that a small grass roots organization such as ours has facilitated this tri-institutional collaboration, bringing together amazing doctors and scientists and furthering the advances of breast cancer research. In addition, we will continue to support our two full time Patient Navigators at the Adelphi Women’s Breast Cancer Support Group who directly help women navigate their journey with breast cancer. Lois and Angela are the life line for nearly 100 women annually. We have donated over $250,000 to provide these critical services and will continue to do so. Without patient navigation so many women in our communities would not be given the same chance Kat was given – timely access to doctors and treatment. What started as a small dream and a big promise five years ago in the waiting room at Memorial Sloan Kettering has turned into something beyond our expectations. As Katerina, George and Despina sat there going over Kat’s options for surgery and treatment, we felt strongly that every human being deserves the chance to fight, to survive and to defeat cancer. We made a promise on that day and we are excited about our accomplishments thus far and what’s yet to come. A heartfelt thank you again to those who joined us last Thursday as we celebrated five years of our mission and to all those who provide your support to help us achieve our dream.